Chinese tourists registered to participate in domestic tourism and outbound tourism products located in nearly 978 cities at home and abroad, to 96 countries and regions around the world. Travel during New Year's Day was off to a great start. Chinese people are more and more willing to spend time and money to give themselves or their family and friends a chance to go on holiday. According to ctrip data, Chinese tourists registered to participate in domestic tourism and outbound tourism products located in nearly 978 cities at home and abroad, to 96 countries and regions around the world.The number of countries visited increased from 66 last year to 96, up 45 percent, with Chinese tourists traveling further and further. According to Ctrip statistics, travelers can select as many as 15 categories of travel products. The most booked holiday products are group tour, fits, tickets, customized tour, cruise, local guide, study tour, theme tour and more. Take outbound tourism as an example, about 50% of tourists choose group tour and 50% choose independent travel. Those choosing private groups and customized tours for parent-child travel have increased by more than 100%, while young people mainly travel independently and are mostly FITs. The top 10 most popular countries for new year include Thailand, Japan, Hong Kong, Vietnam, Singapore, Malaysia, Cambodia, the Philippines, United States and Indonesia. Due to limited vacation time, 65% of tourists choose short trips to Japan and Southeast Asian countries. Thailand topped Japan in popularity this year as a result of the free visa-on-arrival incentive, with Bangkok, Phuket, Pattaya, Chiang Mai and other cities and islands becoming big New Year's day hits. During the New Year's day, more than 20,000 people signed up to travel to Thailand through Ctrip. Japan continues to be one of the most popular outbound destinations for Chinese tourists in 2019. Besides Osaka and Tokyo, Hokkaido is also popular. Visa convenience and winter travel meant that Japan is popular for travelers. According to ctrip, the number of tourists who signed up to travel to Hokkaido for the New Year holiday doubled this year. According to ctrip data, during the New Year's day, the number of mainland tourists who registered to visit Hong Kong through the ctrip platform increased by more than 50%, and the number of independent travelers to Hong Kong increased by 40%. In particular, the number of high-speed railway stations in central and southern China (Wuhan, Changsha and Xiamen) increased by 70%. The number of people applying for HK travel products increased by 150% y-o-y. 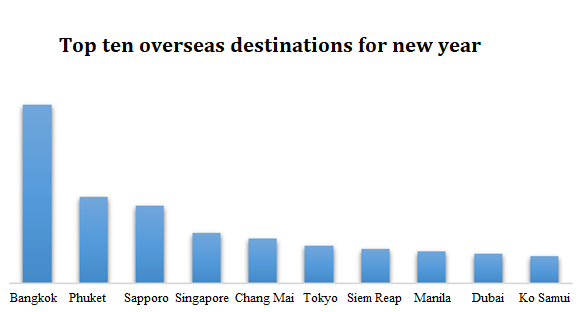 The number of people applying for tour products for Hong Kong, Macao increased by more than 80% year on year. Hong Kong, Zhuhai and Macao private group travel products increased 300% year-on-year. Customized and more personalized travel is still the way to travel for many visitors with 160% increase for those selecting customized travel during the New Year. Top ten overseas destinations for new year include Bangkok, Phuket, Sapporo, Singapore, Chang Mai, Tokyo,Siem Reap, Manila, Dubai, Ko Samui.